Jason Concepcion: A certain raw and wild raggedness has taken hold in the Bulls and Cavaliers’ second-round series — the result of too many injuries to too many players on both sides. It seemed as if every supposedly healthy player who took the floor for Game 4, at one point or another, limped or gingerly held an aching limb or grimaced with some otherwise unspoken bodily pain. The basketball-like product created by these players was not pretty. It wasn’t even homely. It was 48 minutes of fatigue-ridden trench warfare capped off by a halting, near-tragicomic coaching fuckup and finally redeemed by the game-closing heroics of LeBron King James. LeBron justified his nickname in Game 4, and it wasn’t just about the shot. It was also about the play call that led to the shot. Guard your grill, David Blatt. If it seems like LeBron is putting his coach on front street with those postgame comments, well … he is. Here’s the thing, though — in seizing the play call and hitting the game winner, what James really did is save Blatt from himself. In February, Blatt objected to being characterized as a rookie coach. And, with 22 years of experience and numerous European domestic league titles on his résumé, dude has a point, even though in terms of the NBA, the appellation is technically correct. With 8.4 seconds to go in the game, Cleveland with the ball, and the score tied at 84, Blatt attempted to call a timeout that the Cavaliers did not have. The refs missed his vigorous T-motions, which would’ve resulted in a free throw and the ball for Chicago, before Ty Lue dove on him like a bodyguard who just heard a car backfire. Blatt appeared, in those few seconds, every inch the rookie coach that he isn’t (even though he is). What would Blatt’s next few days be like had he C-Webbed that game? We’ll never know, because LeBron James is the King. Does Charles Barkley Dream of Electric Sheep? Danny Chau: Recently, Jeff Teague admitted he isn’t much of an NBA watcher; when he does tune in, it’s usually to catch the fourth quarter. In other words, Jeff Teague is basically your dad. It was truly a phenomenal weekend for the casual NBA interloper. Three games decided by last-second jump shots, three games rife with poor execution and poorer shooting instantaneously salvaged by momentary strokes of crunch-time brilliance. Just like the good old days, right? It was also a great weekend for old-school confirmation bias. The Wizards and the Grizzlies bullied their opponents with their traditional, bruising frontcourts because that never goes out of style (that never goes out of style). The Warriors and the Hawks, who were by far the best jump-shooting teams in the league during the regular season, combined to miss 43 of their 71 uncontested field goals in their Game 3s. Life is but a dream, and it sure does look like we’re living in Charles Barkley’s utopian dreamscape. Sorry for the sardonic tone. To be honest, this inversion of regular-season norms actually might be the best thing to happen in the playoffs. With the Spurs gone and with injuries decimating so many teams, this postseason had lacked a unifying theme. Suddenly the playoffs feel like a referendum on the viability of the new-school view of basketball. Is it a productive discussion? Not if you’re treating it as binary. The Grizzlies aren’t up 2-1 against the Warriors because jumpers are inherently toxic in the latter stages; they’re winning because they’re a great defensive team that has finally rounded back into form after injuries and new additions disrupted continuity. The analytics debate isn’t going anywhere, and there is solace in its eternity. The more you know, the more you realize how little you know, right? Like Jason Concepcion said to me last night, “I love when smart people are wrong. It makes the world interesting.” There have been great moments, but overall, this hasn’t been a great playoffs. It’s gotten a whole lot more interesting in the last few days, though. It’s good enough for dads, it’s good enough for me. Chris Ryan: I’ve heard a bit of chatter around the basketball campfire — just a paragraph above, even! — that this has been a disappointing postseason. That the seeding, injuries, and hacking have tarnished the overall product. I get that. But here’s the thing — and I say this with the total knowledge that I may have spent too much time in deep space with this sport: Basketball does not care. Danny mentioned that the theme of this postseason might be the thoroughly modern struggle between old school and new. I think it’s maybe more eternal than that: This is the postseason of attrition. Kevin Love didn’t die for our sins; he got hurt because a guy held onto his arm for a second or two too long. 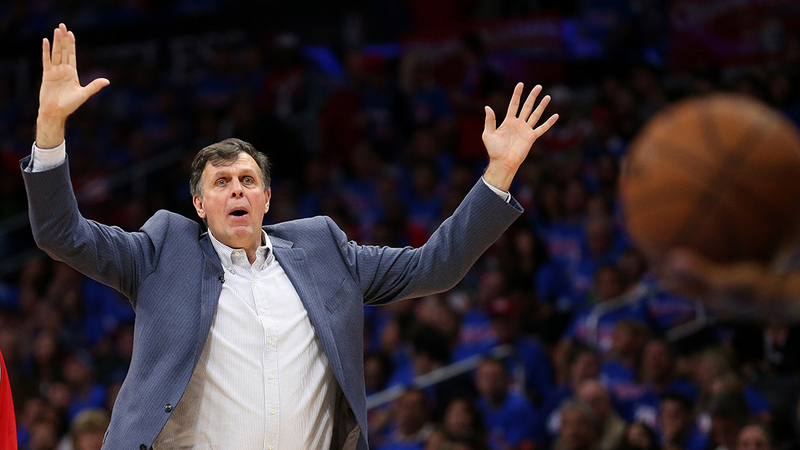 Pop and McHale aren’t fouling DeAndre Jordan to punish us; they’re doing it because he can’t make his foul shots. Sometimes the postseason is about the best players playing the best basketball. Sometimes it’s about Pablo Prigioni playing against Austin Rivers. Sometimes the NBA crowns a winner. Sometimes it crowns a survivor. I’m not hot-taking that this postseason has been entertaining. I’m saying entertainment occasionally takes a backseat to sports. And I appreciate that, even if it’s hard to watch. Kirk Goldsberry: All the world is a passing lane, and Tony Allen is just busting into it, grabbing the ball, and sprinting the other way. In the same way that Allen can turn defense into offense in a flash, he can also turn playoff narratives on their heads. This was supposed to be the year of the Splash Brothers — and it still might be. But Allen’s virtuosic defense is threatening to derail the Warriors’ dream season before the conference finals even begin. People say Allen is a limited offensive player, and that’s kind of true. But with 16 steals in his last four games, Allen is creating incredibly lucrative offensive opportunities for his team. As I wrote when talking about Kawhi Leonard a few months ago, steals don’t just turn defense into offense, they turn defense into the best kind of offense. NBA teams averaged a ridiculous 1.24 points per possession following live-ball turnovers. Those Allen steals generate tremendous offensive chances for Memphis. Last year, Allen muffled Kevin Durant as much as anybody could, and it still wasn’t enough. The Thunder escaped. This year, in an arguably crazier feat, he has made the Splash Brothers look more like the Avett Brothers. The Dubs have hit just 12 of their 52 3s in the last two games, while turning the ball over 37 times. 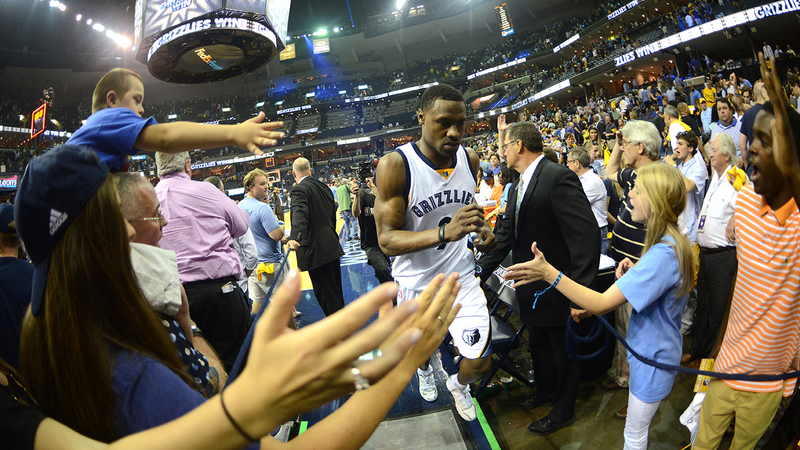 Tony Allen isn’t just the Grindfather — he’s the Splash Bother. That’s the tagline for the 2018 feel-good sports movie blockbuster Coach Dad, with Idris Elba as Doc Rivers and Michael B. Jordan as Austin Rivers (costarring Kevin Hart as CP3). I’ll be honest: When the Rivers trade went down, I thought it was the funniest story in the history of sports. I remember wondering how it wasn’t a much bigger deal. The general manager/coach of a contending NBA team, against all logic and reason, moves mountains to trade for his not-good-at-pro-basketball son. It’s the stuff Saturday Night Live cold opens are made of. That was before this weekend. The Clippers are one game away from the Western Conference finals, and Austin Rivers is too good to play in garbage time of a blowout win. He’s averaging 16 points on 56 percent shooting in the series, and he is a major reason the Clippers survived two games without their Point God. Doc never stopped believing in his son. Is it possible that faith placed is actually beneficial for everyone involved?